Influenced by recent heavy rains, the water level in Chenglingji of Dongting Lake reached 34.44 meters Friday morning, 1.94 meters higher than the warning line. As water sits two meters above the alert level in vast Fanghu Lake in east China's Jiangxi Province, soldiers use forklifts to pour gravel to reinforce the embankment. They are helped in their task by locals, many of them working furiously to fill sandbags with earth beside the lake, a 30-square-km body of water connected to the even mightier Yangtze River. With China suffering disastrous flooding during the latest summer rains, the dangerously high water levels in Fanghu Lake could cause yet more misery. "We are facing huge pressure from possible floods," said Leng Ling, a staff officer with the fourth division of the Armed Police Hydropower Forces (APHF) at the site. The 40-plus members of Leng's division have been working day and night over the past month to strengthen dams, rescue residents from their flooded homes and send anyone sick or injured to hospital. "A few days ago, we were working to strengthen the dam in Jingdezhen City, which was almost inundated," Leng said. "The troops kept working in the water and did not sleep for more than 50 hours." Since the high water season began in early June, China has mobilized soldiers, officials and the public to guard against flooding, which had left 160 people dead and 28 missing in 11 provincial regions by Thursday. According to the Office of State Flood Control and Drought Relief Headquarters, the water levels of the middle and lower reaches of the Yangtze and major fresh-water lakes like Poyang and Dongting are all rising, exceeding warning lines in many sections. 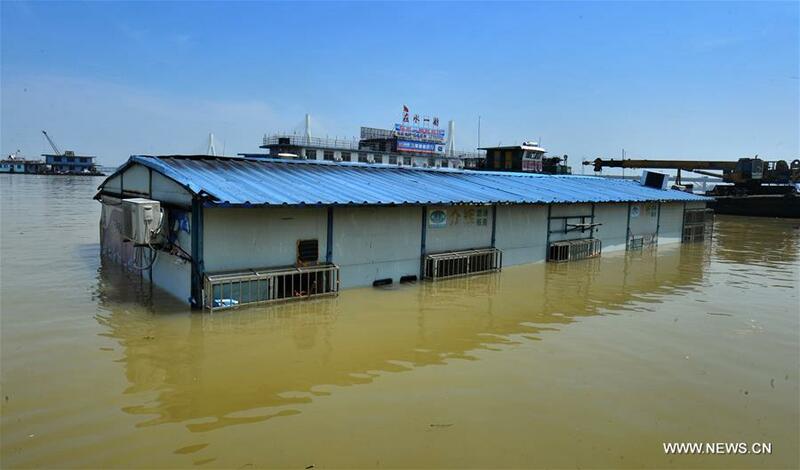 Xinhua reporters this week visited Jiangxi, one of the worst hit areas by floods this year, to see how disaster prevention and relief work is being conducted there. Jiangxi has seen 15 percent more rain than previous years' average. The deluge has caused the water levels of the Yangtze to rise and flow back to its tributaries and lakes. For Wu Aoxiang, the situation has meant intense work on the front line. Wu, ordinarily a chef for his division under the APHF, has been braving heavy rain and extreme heat to fix embankments in Jiangxi, which has experienced 31 downpours since early June. "When the sky clears, it gets very hot and it's easy to get sunburnt while working," said Wu, 23. "All the soldiers' skin has turned very, very dark." Wu's arms are a bizarre red and peeling. His feet have also blistered because they are constantly submerged in water. But Wu said he has become used to it. "I put saving people's lives first," he added. So far, the floods have swept away three dams and an embankment in Jiangxi, with more than 4 million people threatened. Four people have been killed and another remains missing. More than 300,000 hectares of crops have been damaged and 4,252 houses toppled, leading to a direct economic loss of 6.2 billion yuan (928 million U.S. dollars), according to government figures. Under such circumstances, local officials and residents have all been urged to join the battle. In Jiangxi's Pengze County, official and elementary school teacher Yang Kai has spent the past four days patrolling an embankment, inspecting it for seepage. Many of the houses in his village have already been flooded with water from Poyang Lake. Yang is particularly concerned about "piping," the destabilizing effect that occurs when water penetrates an embankment, potentially causing full-scale leakage, a landslide or even endangering the whole embankment. "What we do is check if there is any muddy water alongside the embankment," he said. "If we find any signs of seepage, we put a red banner or plastic bag at the spot so that soldiers will come and fix it." It is no easy job. Working in groups of three, officials like Yang have to patrol the 2-km-long embankment for several hours a day. "I work in shifts, sometimes from midnight until afternoon of the next day, which is intense," Yang said. "But I know it's for our own good." So far, soldiers have been able to stopper all the seepage points the inspectors have found. "The situation now is fine, but we have to stay alert," Yang said. Residents elsewhere are joining the flood control campaign. In Jiangxi's Furong Farm Town, locals have volunteered to help with inspections, putting up alert signs and delivering food and water to soldiers. "My son is about their age and it breaks my heart to see them working non-stop in heavy downpours and scorching heat," said a villager surnamed Wang. "But I know this is a special period and I hope they can take care of themselves while working." Chinese authorities are sparing no effort in battling the floods. This week, Premier Li Keqiang said China should prepare for an arduous campaign against floods as July-August is "a key period for flood control." The People's Liberation Army and armed police will send more troops to disaster-hit areas on the direct orders of President Xi Jinping. Meanwhile, local governments have urged migrant workers in big cities to come back to help bail out their hometowns, as most of those living in China's rural areas are the elderly and the young. But more tests are on the way. Typhoon Nepartak is whirling toward the mainland and is forecast to bring strong winds and downpours to many parts of China, including Jiangxi. As the sun set, soldiers around Fanghu Lake sat down and had simple meals on the embankment while still in their uniforms and muddy shoes. "We are facing a tough battle," APHF soldier Liu Qing said as he wiped sweat from his forehead. "But I believe we will make it through."